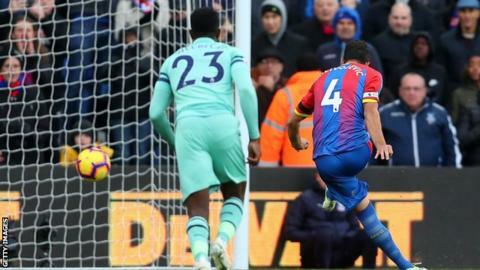 Crystal Palace captain Luka Milivojevic scored twice from the penalty spot to earn his side a dramatic draw against Arsenal and end the Gunners' 11-game winning run. The Serb smashed in a late equaliser after Pierre-Emerick Aubameyang's controversial goal had put the visitors ahead after the break. Granit Xhaka's sublime free-kick had drawn Arsenal level at 1-1. Wilfried Zaha was brought down by Xhaka in the box with seven minutes to go and Milivojevic drilled his spot-kick to Arsenal keeper Bernd Leno's right corner, having also beaten him on that side in the first half. Earlier in the second half, the ball appeared to brush Alexandre Lacazette's hand before it fell at the back post to Aubameyang, who poked home off the inside of the post - with the ball going over the line by just 9mm. Xhaka's stunning curler had cancelled out Milivojevic's opener - which was Palace's first goal at home this season - but the Arsenal midfielder brought down Zaha to give away the late penalty. Zaha also hit the outside of the post before the break, while Andros Townsend dragged a shot wide. Palace substitute Max Meyer struck over the bar from close range later in the second half and Alex Iwobi's deflected shot flew wide. Arsenal remain fourth in the Premier League table, a point behind Manchester City, while Palace move up to 14th and three points above the relegation zone. Match ends, Crystal Palace 2, Arsenal 2. Second Half ends, Crystal Palace 2, Arsenal 2. Offside, Crystal Palace. Luka Milivojevic tries a through ball, but James Tomkins is caught offside. Matteo Guendouzi (Arsenal) is shown the yellow card for a bad foul. Attempt missed. Granit Xhaka (Arsenal) left footed shot from outside the box is high and wide to the right from a direct free kick. Substitution, Crystal Palace. Jason Puncheon replaces Cheikhou Kouyaté because of an injury. Attempt missed. Patrick van Aanholt (Crystal Palace) left footed shot from outside the box misses to the right. Assisted by Luka Milivojevic. Goal! Crystal Palace 2, Arsenal 2. Luka Milivojevic (Crystal Palace) converts the penalty with a right footed shot to the bottom left corner. Penalty conceded by Granit Xhaka (Arsenal) after a foul in the penalty area. Attempt missed. Patrick van Aanholt (Crystal Palace) right footed shot from outside the box misses to the right following a set piece situation. Stephan Lichtsteiner (Arsenal) is shown the yellow card for a bad foul. Substitution, Arsenal. Aaron Ramsey replaces Pierre-Emerick Aubameyang. Corner, Arsenal. Conceded by Mamadou Sakho. Attempt blocked. Alex Iwobi (Arsenal) right footed shot from outside the box is blocked. Assisted by Stephan Lichtsteiner. Attempt missed. Luka Milivojevic (Crystal Palace) right footed shot from outside the box is too high. Assisted by Cheikhou Kouyaté with a headed pass. Substitution, Arsenal. Danny Welbeck replaces Mesut Özil. Attempt missed. Max Meyer (Crystal Palace) left footed shot from the left side of the six yard box is just a bit too high. Assisted by Wilfried Zaha. Attempt blocked. Wilfried Zaha (Crystal Palace) left footed shot from the left side of the box is blocked. Assisted by Andros Townsend. Attempt missed. James Tomkins (Crystal Palace) right footed shot from outside the box misses to the left. Max Meyer (Crystal Palace) hits the left post with a left footed shot from a difficult angle on the left. Assisted by Wilfried Zaha following a set piece situation. Substitution, Crystal Palace. Alexander Sørloth replaces Jordan Ayew.